Turn a classic meal into a fun kid-friendly dish with this Easy Shepherd’s Pie Recipe made in individual servings. It’s a great way to keep an easy dinner on hand in the freezer for those busy nights. When the temperature drops all I want is cozy comfort food and shepherd’s pie is definitely a favorite. Who can resist warm mashed potatoes over beef and vegetables? Not me! This is an easy dish to throw together for when you want comfort food in individual serving sizes. They would be a great way to keep a quick meal in the freezer as well. The best part is that there are no weird ingredients here, just things you probably already have in your freezer and pantry. Click below to print off a copy for your recipe binder. 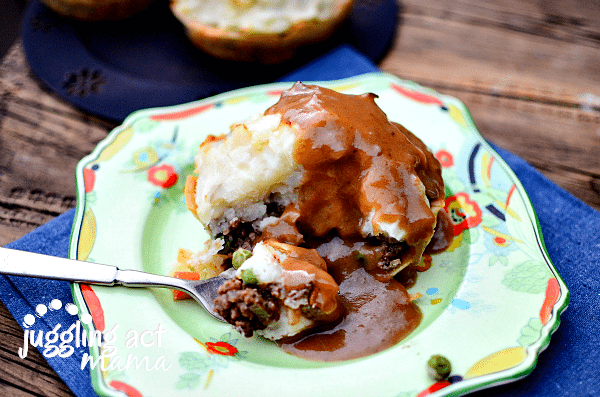 Trust me, you’re going to want to make these Mini Shepherd’s Pies again and again! Preheat oven to 450 for baking crusts, then turn down to 350 for baking pies. 1. Roll out pie crusts and measure by tracing the outlines of the foil tins, approximately ½ inch past the rim onto the dough, as shown. If using a muffin tin, measure the diameter of the muffin cup and add ½ inch. Place into the greased tins and overlap the dough to make fit. Prick the dough with a fork over the bottom and sides, and bake for approximately 8 minutes or until brown. When finished, let cool. 2. Meanwhile, in a skillet, sauté the onion and celery till translucent and add the beef. Cook thoroughly and add the seasonings. Sprinkle ½ tbsp. of flour over the beef and add the frozen vegetables. Stir together to dissolve the flour and then add 1 C of the beef stock. Continue to stir until stock thickens and forms a gravy. Take off the heat and set aside. 3. In another pot, boil the potatoes until soft, drain and mash with cream and 1 Tbsp. of the butter. Set aside, covered. 4. Take the crusts and spoon in the hamburger mixture until it reaches the top of the crust. Pack down slightly. Then, spoon the mashed potatoes into a mound on top of the meat. Smooth out if you wish or leave a rustic look. Repeat with the additional 5 dishes. 5. Bake at 350-degrees F until the heated through. 6. In a medium saucepan, combine the butter and flour over medium high heat and whisk together. Cook for 1-2 minutes to remove the raw flour taste. 7. Whisk in the remaining beef stock. Cook for an additional 2 minutes. 8. Top each pie with a spoonful or two of the gravy, as desired. These individual meals are perfect for busy families on-the-go. When you’ve got to get kiddos out the door for afterschool activities, you don’t have time make a big meal. Of course, you still want to put a wholesome dinner on the table. Take these out of the freezer in the morning, then pop them in the oven to warm through at dinner time. Serve with some quick brown gravy if you like. 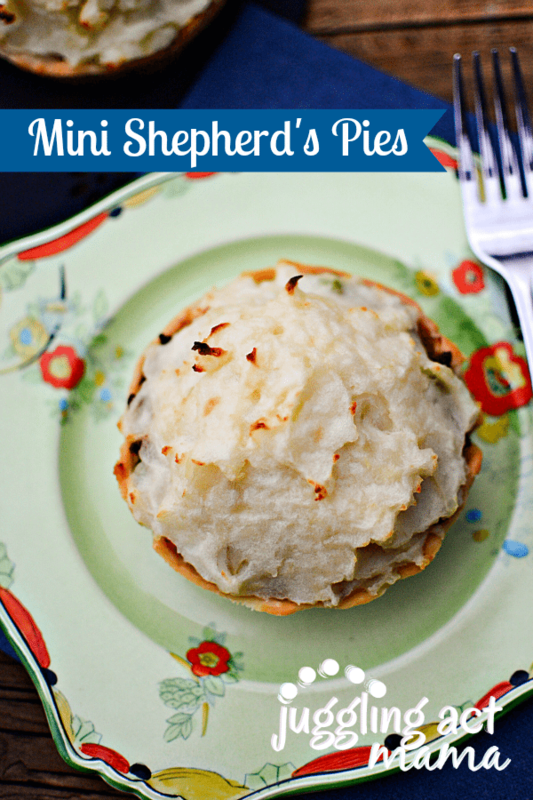 These Mini Shepherd’s Pies are also a great dish to bring to someone who just had a baby. New moms never have time to cook big meals, but as we all know, a delicious home cooked meal is a Godsend! Because we test all our recipes, we recommend that you make them once just as it is without substitutions or changes. Sometimes variations can go awry. Making this recipe as we have tested it will yield the best results. If you really want to get creative, here are some ideas for variations that might work well. (Please note, we have not tested these variations). It’s easy to switch up the veggies to include your family’s favorites. Peas, corn, and carrots all taste wonderful in sheperd’s pie. If you’re really ambitious, you can make your own homemade pie crust,. but I prefer using the store bought dough because it’s so much quicker. What’s better than the smell of delicious homemade bread wafting through the house? Check out this recipe for Make-Ahead Soft Yeast Rolls from Baker Bettie. Our Sausage and Pepper Mac and Cheese is always very popular and simple to make up ahead of time. For a quick side dish, whip up these Make-Ahead Brussels Sprouts and Bacon from Treasured Mom. If you love sweet potatoes, you have to try our very own Make Ahead Mashed Sweet Potatoes with Brown Sugar! Oh yummy! Everything is just more fun when it is in mini! Do you bake the completed dish? The recipe just sort of leaves you hanging. So sorry about that! Yes, you bake them at 350-degrees F until the heated through. Are there some missing directions? There are 3 ingredients that were not all used – flour, butter, and beef stock. Either the amounts in the ingredients list are incorrect, or there is another use for the remaining 1/2 T. flour, 1 T. butter, and 1 c. beef stock. Maybe a gravy is made for the tops of the mini pies?